When we come across circuit boards which are previously designed or we take out one from old TV or computer, in attempt to repair it. And sometimes we need to know the capacitance of particular capacitor in the board to eliminate the fault. Then we face a problem in getting the exact value of capacitor from the board especially if it is a Surface Mount Device. We can buy equipment for measuring the capacitance, but all these devices are costly and not for everyone. With that in mind we are going to design a simple Arduino Capacitance Meter to measure the capacitance of unknown capacitors. This meter can be easily made and also cost effective. 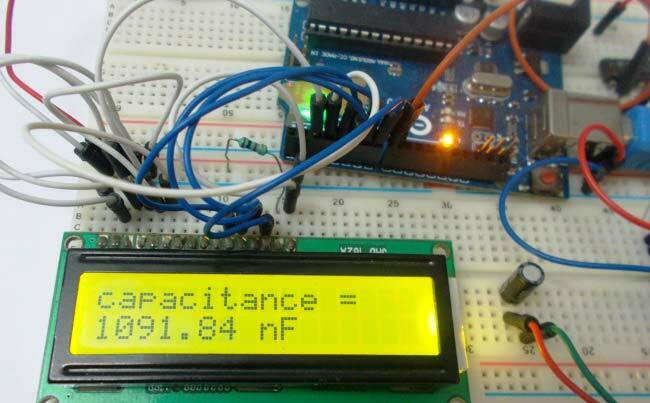 We are going to make Capacitance Meter using Arduino Uno, Schmitt trigger gate and 555 IC timer. IC 74HC14 Schmitt trigger gate or NOT gate. The circuit diagram of the Capacitance Meter using Arduino is shown in below figure. Circuit is simple, a LCD is interfaced with Arduino to display the measured Capacitance of capacitor. A Square wave Generator Circuit (555 in Astable mode) is connected to Arduino, where we have connected the Capacitor whose capacitance needs to be measured. A Schmitt trigger gate (IC 74LS14) is used to ensure that only rectangular wave is fed to Arduino. For filtering the noise we have added couple of capacitors across power. This circuit can accurately measure capacitances in range 10nF to 10uF. First of all we will talk about 555 Timer IC based square wave generator, or should I say 555 Astable Multivibrator. We know that the capacitance of a capacitor cannot be measured directly in a digital circuit, in other words the UNO deals with digital signals and it cannot measure capacitance directly. So we use 555 square wave generator circuit for linking the capacitor to digital world. Simply speaking, the timer provides square wave output whose frequency directly implicates to the capacitance connected to it. So first we get the square wave signal whose frequency is the representative of the capacitance of the unknown capacitor, and feed this signal to UNO for getting the appropriate value. Frequency (F) = 1/ (Time period) = 1.44/ (21000*C). In our Program Code (see below), for getting the capacitance value accurately we have calculated the result in nF by multiplying the obtained results (in farads) with “1000000000”. Also we have used ‘20800’ instead of 21000, because the accurate resistances of RA and RB are 0.98K and 9.88K. So if we know the frequency of the square wave we can get the capacitance value. The signals generated by the timer circuit are not completely safe to be directly given to the Arduino Uno. With the sensitivity of UNO in mind, we use Schmitt trigger gate. Schmitt trigger gate is a digital logic gate. We are going to use 74HC14 chip, this chip has 6 Schmitt Trigger gates in it. These SIX gates are connected internally as shown in below figure. We connect the signal generated by timer circuit to ST gate, we will have rectangular wave of inverted time periods at the output which is safe to be given to UNO. The pulseIn function measures the time for which High or Low level is present at PIN8 of Uno. The pulseIn function measures this High time (Htime) and Low Time (Ltime) in micro seconds. When we add Htime and Ltime together we will have the Cycle Duration, and by inverting it we will have the Frequency. Once we have the frequency, we can get the capacitance by using the formula we discussed earlier. So in summary, we connect the unknown capacitor to the 555 timer circuit, which generates a square wave output whose frequency is directly related to capacitance of capacitor. This signal is given to UNO through ST gate. The UNO measures the frequency. With frequency known, we program the UNO to calculate the capacitance by using formula discussed earlier. So that is how we can simply measure the Capacitance of any capacitor. Works just fine Sir! Almost like magic..hehe. Thanks a lot Raja. Great idea, but I can't figure out the for statement. When the loop starts, Htime and Ltime are both zero, so I don't know how you get an average. I must be missing something? Htime and Ltime are never been zero, please check program again. Great work. Easy to build; works nicely. Thank you for your interesting project. Can you please explain how you calculate the range of the capacitance that the circuit can measure?